These letters, telegrams, and other business and political/military correspondence involve Thomas C. Stevens or Governor Thomas Carney. Carney and Stevens had opened the first wholesale house in Leavenworth together in the spring of 1858. This collection contains many of Governor Carney's personal papers, not found in his administration records collection. 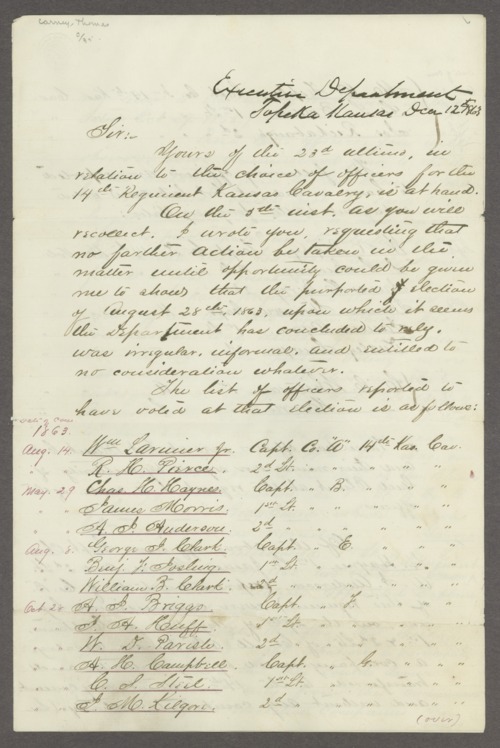 In two letters, dated September 3, 1863, Major General John McAllister Schofield, commander of the Department of the Missouri for the Union Army, writes to Governor Carney accepting the services of the Kansas militia to help protect border towns. He also announces his intentions to "publish an order prohibiting all armed men, not in the service of the United States from passing the Missouri line." This correspondence also includes a number of telegrams that Governor Carney received from various individuals. Thomas Ewing Jr., commander of the District of the Border, wrote to Carney on August 27, 1863 asking him to use his influence to prevent a raid into Missouri in retaliation for Quantrill's Raid. Samuel R. Curtis, commander of the Army of the Border, wrote to Carney on June 7, 1864 reporting on bushwhackers and hostile Indians. Collections - Manuscript - Stevens, Thomas C.